The government has amended the hydropower policy to provide relief to independent power producers (IPPs) in case of delay in implementation of hydroelectric projects and rationalise the rules for capacity optimisation (enhancement). Alleging that the indiscriminate exploitation of the hydropower potential in the Sutlej is spelling doom for the environment and the ecologically fragile tribal district of Kiannur, Congress leader GS Bali today demanded a review of the power policy to step the rot. The Sub-Divisional Office (Civil) will function from Dalhousie and Salooni for a fortnight each month to cater to revenue and other administrative services requirements of people of the area. The Central Empowered Committee for Environment and Forests has directed the state government to rationalise the demand of land for Central University of Himachal Pradesh. The government today approved a policy for filling posts of teacher in the tribal and notified backward areas under which appointees will be paid on the basis of periods taught. The International Roerich Memorial Trust (IRMT), Naggar, has kicked up a fresh row as certain IRMT trustees have raised questions as to how “a Finland national has been staying in its guest house since June 11 without registering with the Foreign Registration Office (FRO), Kullu”. Farmers owing affiliation with the Himachal Lokhit Party (HLP) held a dharna in front of the office the Deputy Commissioner (DC), Kangra, here today. They were alleging that the state government had not set up any mandi in their area where they could sell their grain produce, including rice and wheat. The inordinate delay in announcing the fertiliser policy by the state government has reduced fertiliser sales by over 50 per cent as farmers have been forced to make purchases at higher costs. The BJP today said it was fully prepared to take its fight against corruption to its logical end, be it in the court of law or among the public as desired by former Union Minister Virbhadra Singh. With the Congress setting the stage for ousting the ruling BJP from power by holding successful rallies in the state, efforts to quell rising dissidence might not yield results as chances of Rajya Sabha MP Shanta Kumar turning up for the scheduled meeting with Chief Minister PK Dhumal here on June 30 appear bleak. In the wake of the forthcoming Assembly elections in the state scheduled to be held by the end of this year, the All-India Congress Committee (AICC) has appointed Jahida Khan as its poll observer for Chamba district. “Relegated to the backseat by mobile phones, landline telephones are set to recover the lost ground with the introduction of the next generation high-quality video call services, which will provide a decisive edge to the BSNL over competitors,” asserted RK Kapoor, Chief General Manager, BSNL, Himachal Circle, here today. The Bilaspur Nagar Parishad has finally taken concrete steps to provide a suitable cremation ghat for this town within a year or so. Terming the criticism of his documentary “Malana-One Day Ahead of Democracy”, as unwarranted, Amlan Datta asserted that it chronicled what was happening in Malana in the 2007-10 period. It had also brought out the debate on decriminalisation of cannabis and showed how prohibition benefited the police and parts of the administration. Five members of a family were killed when the vehicle they were tarvelling in rolled down a deep gorge at Ghorna curve near Deha village on the Theog-Chopal road. Under the existing policy, IPPs are charged with a penalty at the rate of Rs 10,000 per MW per month for delay but the scheduled commercial operational date (SCOD) is not extended. As such, in case of actual operational period available to the IPPs for projects allotted on a build operate and transfer (BOT) basis for a 40-year period, is reduced. For instance, if a project is delayed by three years the actual operational period available to the IPPs will be reduced to 37 years. This clause has been amended to help extend the SCOD to ensure that the project remains in operation with the IPP for 40 years. The IPPs will be required to take prior permission and approval of the government for enhancement of capacity. In case of capacity optimisation, the IPP will have to pay a premium of Rs 1 lakh up to an enhancement of 0.5 MW, Rs 2 lakh up to 1 MW and Rs 5 lakh for over 2 MW in case of small projects. In case of projects above 5 MW they will be required to pay an upfront premium at the rate of Rs 20 lakh per MW or the rate at which upfront premium was paid for project awarded through bidding for the enhanced capacity. The IPPs will also have to give an additional 3 per cent free power for the entire 40-year period but only on the enhanced capacity. Principal Secretary, Power, Deepak Sanan, said earlier, the IPPs were not required to pay anything up to an increase of 20 per cent in the capacity. However, for enhancement in excess of 20 per cent they were required to pay an upfront premium at the rate of Rs 20 lakh per MW and also give 3 per cent additional free power on the total capacity, which seemed irrational. Under the amended policy, upfront premium and additional free power will have to be given for even 1 per cent increase in the capacity. The capacity mentioned in the letter of consent or allotment letter will be deemed as the original capacity of the project. There are over 24 small and big projects that have raised their installed capacity, which will now be dealt under the policy. Starting the third phase of his Rath Yatra to highlight the issue of corruption from Chitkul, a village close to the China border in Kinnaur, he said private power companies were ruling the roost and local residents were suffering due to projects being constructed by them in utter disregard of environmental norms. Big companies like Jaypee Associates had acquired vast stretches of land, much more than their actual requirement, and even raised apple orchards, while local residents had been rendered landless. Moreover, there was no employment for locals in projects and the condition of providing 70 per cent jobs to Himachalis was being implemented only on paper. He said it was high time that the government reviewed the power policy as the environmental degradation being caused due to construction of power projects was affecting tourism, which had a good employment potential. He said during the course of the yatra, which passed through Karcham, Tapri, Bhabhanagar, Rampur, Narkanda and Theog, residents of these places handed over several complaints against power companies to him. He would compile a report after going through these documents provided to him and raise the issue at all levels after completing the yatra. These directions were passed by Chief Minister PK Dhumal at a Prashasan Janta ke Dwar programme at Salooni township in Chamba district, after formally opening the office of Sub-Divisional Office (Civil) at Salooni and naming it as Sub-Divisional Office (Civil), Salooni-Dalhousie, today. The Chief Minister said the state government had been receiving representations from different quarters to shift the office from Dalhousie to Salooni, which had larger chunk of population of the sub-division and was located in the far-flung area. Dhumal said the state government would be considering the demand of people of Sanooh gram panchayat to divide it into panchayats. He also announced the upgradation of Government Primary School, Dharbheran, to Government Middle School. Local MLA Renu Chadha thanked him for his visit to her home segment and funds provided for developmental activities during the past four years. The state had sent a case for diverting 7,000 kanal forest land at Dehra and Dharamsala for constructing two campuses of the university. The Forest Department had evaluated that diversion of the 7,000-kanal land involved about 1 lakh trees. Local sources said the committee was of the view that since the entire forest land was earmarked by the state for the construction of the university, the demand of land for the project can be rationalised. Furqan Qamar, Vice-Chancellor (VC) of the university, admitted that the central committee had asked the state to rationalise the demand of land for the university. He, however, said the Chief Secretary, Himachal Pradesh, has written back to the committee that the decision regarding the amount of land required for the project was taken by the Central Site Selection Committee keeping in view the future expansion of the university. He also clarified that though the university was taking over about 7,000-kanal land, only about 44 acres would be put under construction at Dharamsala and Dehra. The remaining land would be maintained as a green patch. The VC said the matter was also taken up with Union Minister for Human Resource Development Kapil Sibal in the recent past. He has assured to intervene in the matter so that the land for the university was allotted at the earliest. The VC said as per his information, the permission process for allocation of the land was at its last leg. The process of allotment for land for the university has been delayed by about two years since the state chose to earmark forest land for the project. Diversion of any kind of forest land for other purpose has to have permission of the central committee on environment and forests formed on the orders of the Supreme Court. The bifurcation of the central university into two campuses at Dharamsala and Dehra has also generated political heat. Former Chief Minister Virbhadra Singh while talking to mediapersons in the recent past at Dharamsala had criticised the move to bifurcate the campus of the central university. Due to the apprehension created by Virbhadra, Ramesh Dhawala, Minister for Food and Civil Supplies, along with his supporters, met the VC to know the status. The VC, however, while talking to The Tribune clarified that the Centre has committed to set up the university at two places in Kangra district, including Dharamsala and Dehra. As per the policy cleared by the state Cabinet, which met under the chairmanship of Chief Minister PK Dhumal, here, the teacher will be recruited through school management committees and the local educated unemployed trained youth would be given preference. Postgraduate teachers for Class XI and Class XII will be paid Rs 150 per period and for IX and X classes Rs 100 per period, trained graduate teachers will get Rs 100 per period with a limit of maximum of Rs 6,000 per month, Shashtri and language teachers Rs 75 per period up to a maximum of Rs 4,500 per month and JBTs Rs 75 per period up to a maximum of Rs 3,500 per month. It decided to launch the “Bal and Balika Suraksha Yojna” to motivate people to adopt orphan and destitute children. Any family with annual income of below Rs 60,000 and free from any serious ailments will be eligible to become custodian of the children. The government will provide a financial grant of Rs 500 per month per child to the family. It also decided to amend selection criteria for anganwari workers and helpers to give preference to sewing teachers of respective panchayats in recruitment, along with widows, unmarried and those married women whose husbands have been missing for the past seven years. The Cabinet has also cleared the MoU to be signed with Punjab for the execution of the Anandpur Sahib-Naina Devi Ropeway Project in a public private partnership mode on a build, operate and transfer basis by creating a “special purpose vehicle” consisting of 10 directors, five from each state. The concession period will be 40 years and construction period three years. The project aims at giving a boost to religious tourism in the two states. It was also decided to regularise daily wage workers working in different departments who have completed 8 years of regular service on March 31, 2012, with a minimum of 240 days in a calendar year and grant daily wage rank to 274 part-time revenue chowkidars. It excluded panchayats of Dugha and Bajuri in Hamirpur and Tunan, Poshna and Thachwa in Nirmand from the purview of the State Town and Country Planning Act. The Cabinet decided to name the Harsipattan bridge over the Beas as “Samir Setu” after Martyr Major Samir Katwal of Sandhol. They have also objected to the continuation of controversial curator Elina Adamkova at the office as she was removed in March this year by Chief Minister PK Dhumal, who is also the president of the IRMT. Even the complaint regarding the “unreported stay” of the guest has reached the state CID and intelligence agencies when they came to know about it on June 18, said insiders. The guest has been identified as Gergiev Yakolov from Helsinki, Finland, sources said. Neither the guest house nor the guest reported at the FRO, Kullu, within 24 hours after his arrival, which is mandatory under Section 14, Foreigners Act. Gergiev had been visiting the IRMT over the years and was staying in the guest house with the curator, charged insiders. Surprisingly, the guest house register was handed over to the manager of the gallery three days ago by Elina after repeated persistence from a senior official from the state registering authority. His name had been entered in the register, said IRMT manager, who refused to comment more on the same. Ashok Kumar, SP, Kullu, said the police had not received a C-Form from the guest house nor had the foreign national reported at the FRO. of frustration to damage her reputation. In fact, a seven-member team from the ICR, Moscow, and state officials are currently making inventory of the artefacts and personal belongings of the Russian painter at the art gallery. Director, Art, Language and Culture, Rakesh Kanwar, claimed that Elina would be relinquished of the charge of curator soon after the documentation work at the gallery was complete. “She has been removed, but she will stay on till the work is over”, he added. 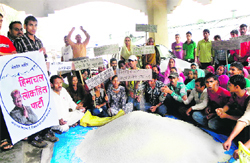 The farmers also heaped rice in front of the DC’s office alleging that they did not have any outlet where they could get minimum support price for their grain produce. The farmers alleged that the entire policy of the state government was targeted at apple farmers. They were compensated in case their crop was damaged due to hail or any other natural reason. However, farmers of lower areas faced drought and floods, but were never compensated for the damage to their crops, they alleged. Balbir Chaudhary, who was heading the protest, alleged that in case the government did not heed to their demand, they would be forced to launch an agitation. Interestingly, farmers who had come for the protest had brought rice along with them whereas the sowing of paddy is yet to start in the region. The state government makes available a subsidy of Rs 25 per 50 kg bag on various complex fertilisers and Rs 10 per 50 kg on other nitrogen-based fertilisers, besides granting freight subsidy and loading and unloading charges. Since no policy had been announced for the current year, depot holders and cooperative societies were selling fertilisers at non-subsidised prices and even charging freight charges from farmers. Figures revealed that in Solan district as against the purchase of 533 metric tonnes (MT) urea in June last year only 145 MT had been purchased by farmers this year and as against the purchase of 180 MT of complex fertiliser NPK last year only 155 MT had been purchased this year out of which 150 MT was purchased by farmers of the Nalagarh area alone. In the adjoining Sirmaur district too, the purchase of fertilisers has been quite low with barely 150 MT of urea having been purchased till now as against the sale of 290 MT in the corresponding period last year, while merely 65 MT of complex fertiliser has been purchased till now as against the sale of 127 MT in June last year. These figures illustrated how farmers were forced to restrain themselves from buying fertilisers, which were selling at higher prices without subsidies. Depot holders rued that sales had failed to pick up as no subsidies were available and farmers were forced to make purchases on full amount. With the sowing season for various kharif crops already in progress and the onset of monsoon expected in early July, this indecisiveness of the state government had defeated the very purpose of subsidies. Farmers, who had irrigation facilities, were forced to make these purchases as the sowing season was already underway. Though the Director, Agriculture, had stated that the policy would be soon put up in the Cabinet meeting for clearance, no such agenda was listed in today’s meeting. It was learnt that the policy was yet to be cleared from the Finance Department. Addressing a press conference here today, former MP and head of the national legal cell of the BJP Satya Pal Jain said his party was fully prepared for the fight, both legally as well as politically. “However, I want AICC chief Sonia Gandhi and Prime Minister Manmohan Singh to clarify the Congress stand on the issue as Virbhadra Singh is still a party MP,” he quipped. He termed the statement of the Congress leader of putting the blame on the BJP for the whole case not only unfortunate and highly objectionable, but also amounting to contempt of court. “I strongly refute allegations of political vendetta against the BJP which never overstepped its jurisdiction as the case was probed impartially and challan put up in court,” he said. “Our party takes strong exception to Virbhadra’s statement that the BJP was behind the case as in the entire frame of things we figure no where as the CD was released by his one-time Cabinet colleague while he was the Chief Minister,” he said. He also pointed out that the former minister should have objected that it was not his voice when he was Chief Minister for six months after the release of the CD by Vijay Singh Mankotia in May 2007. He also added that the BJP would not succumb to pressure and threats being issued by Virbhadra Singh who tried to intimidate police officers during the course of investigation by issuing statements. “Law will take its own course and the application for the cancellation of bail granted to the Congress leader is already pending in court as it was being apprehended that he might try to influence investigation using his clout,” said Jain. Despite the intervention of party chief Nitin Gadkari, who has held meetings with Dhumal and Shanta to contain dissidence and bickering, it is unlikely that the former Chief Minister will attend the scheduled meeting. Shanta is unlikely to come as he is still not convinced about the corrective measures taken so far at the instance of the high command. Certain crucial issues like the party’s stand on the show-cause notice served to Rohru MLA Khushi Ram Balnatah and deciding the fate of Kangra MP Rajan Sushant had to be taken at the proposed meeting. With Shanta unlikely to attend the meeting, also on health grounds, the stalemate could continue further. Shanta will maintain his distance from party functions, including campaigning in the Assembly poll. “With the Shanta camp still not softening its stand, the possibility of Balnatah also being suspended from the party are high as he took the extreme step of demanding change in the leadership,” said a party leader. He said this was also important as the party wanted to send out a clear signal that dissidence would not be tolerated at any cost. In the wake of former Union Minister Virbhadra Singh’s outburst against the BJP and his resolve to expose Dhumal, senior BJP leadership is keen to set its own house in order as in the coming days the Congress is likely to launch scathing attack on the ruling party and the government. The BJP high command is of the opinion that since Congress leaders have started putting up a united show, the BJP must also put its house in order if it wants to ensure its return to power in the Assembly elections, scheduled to be held by the end of the year. On her arrival here today, Jahida held meetings with Congress leaders, activists and the rank and file of the party and geared them up for the elections. She would be touring the district for about five days and holding parleys with party leaders and activists to thrash out a strategy for giving a clean sweep by winning all the five Assembly seats of the district. An official communiqué here today by District Congress Committee general secretary Manav Abrol said Jahida was the Education Minister in the Rajasthan Government. Her first phase of the tour would culminate on July 1, it added. Launching the service introduced in collaboration with the Sai Info Systems (SIS) in the PPP (public private partnership) mode, he said the BSNL customers already having a landline-based broadband connectivity could avail the service right away using the videophone devices developed by SIS. The new service would provide video conferencing and video calling without desktop computers and Internet. The BSNL had the largest landline based tele-network and as people were much more comfortable using a telephone as compared to a computer, with the new videophone call services the landlines would be back in the reckoning. The dependence on mobile phones in homes would decline in due course as a result, he stated. Senior vice-president, SIS, Rajiv Gupta said soon public call offices (PCOs) would be upgraded into video call offices (VCOs) and even poor migrant workers would be able to have face to face interaction with family members. The cost of governance would be curtailed as officials would not have to travel for meetings as video call service would make video conferencing a routine. This was stated by parishad president Rajni Sharma while presiding over a meeting of prominent citizens and representatives of various organisations at the Nagar Parishad hall here on Sunday. She said Rajya Sabha MP and former MLA and minister from this Bilaspur Sadar constituency JP Nadda had sanctioned Rs 30 lakh for this purpose while DC Ritesh Chauhan had also assured that funds would be made available. The meeting decided that the site selected a few years ago at Bharatpur on the bank of the Sutlej, near the centuries-old traditional cremation ghat of old town of Bilaspur, was most suited for the same. This cremation ghat would be constructed there at an estimated cost of over Rs 2 crore on a raised ground to keep it outside water even when Gobind Sagar takes its full shape every year. A cloth merchant, Dinesh Pal Munna, donated Rs 1 lakh in memory of his mother. Other citizens also donated money between Rs 25,000 and Rs 10,000 on the spot. Reacting sharply to the issues raised by former Narcotic Control Bureau official OP Sharma and filmmaker Vivek Mohan, he called for an open debate. He suggested that his film and the one made by Vivek be screened before a gathering of social thinkers, bureaucrats, politicians, academicians, students and the public, and they should be allowed to judge whether it portrayed the reality of Malana or not. He was an internationally recognised filmmaker and not indulging in “pseudo-activism” in the garb of making documentaries as alleged by Vivek. “My last film was premiered in Berlinale-08 and my brother Anirban, who produced the film, and I had won two more national awards,” he said. Sharma was a courageous officer who busted many “foreign mafia”, but neither the production nor the trade of “bhang” had decreased. It has only changed hands to local mafia and some political strongmen. The mishap took place in the evening when the family was on its way to attend a wedding in a nearby village. According to the police, there were eight persons in the ill-fated vehicle (HP-08-1017) when the accident occurred. All the five deceased belonged to Sayana village in the Malog area of Chopal. Chopal MLA Subhash Manglet, who was away to Delhi, has asked the administration to provide immediate relief to the families of the deceased and the injured.